In terms of frontal impact performance, the current Aygo is the same as the Citroën C1 that was tested in 2005 and the results of that test have been used here. The passenger compartment remained stable in the frontal test. However, the driver’s chest struck the steering wheel during the impact and the score for that body region was penalised. Dummy readings indicated good protection of the knees and femurs of both the driver and passenger. However, inspection of the dashboard showed that some structures might pose a risk of injury to occupants of different sizes and to those sat in different positions. There was little deformation at the footwell but testers noted that the brake pedal was displaced rearward and was blocked, increasing the risk of injury to the driver’s lower legs and feet. In the side barrier and more severe side pole impacts, the car was equipped with side impact head and thorax airbags which are available as an option now on some variants but become standard on all variants in July 2013. In both tests, dummy readings indicated marginal protection of the chest. The seat and head restraints provided poor protection against whiplash injury in the event of a rear-end collision. 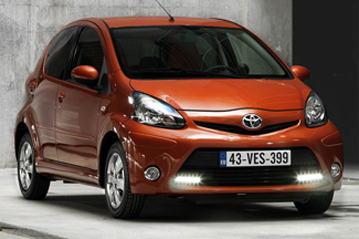 Based on dummy readings in the frontal and side tests, the Aygo scored maximum points for its protection of the 3 year infant. That dummy was sat in a forward-facing seat, using ISOFIX anchorages which are not currently standard equipment but which will become so in July 2013. Forward movement of the head was not excessive and, in the side impact, both dummies were properly contained by the shells of their restraints, minimising the likelihood of head contact with parts of the car interior. The passenger airbag can be disabled to allow a rearward-facing child restraint to be used in that seating position. However, information provided to the driver regarding the status of the airbag is not clear and the system was not rewarded. The dangers of using a rearward-facing restraint in that seating position without first disabling the airbag are clearly indicated on the inside of the car. Electronic stability control is currently optional on some variants but becomes standard equipment on all variants in July 2013. The system met Euro NCAP's test requirements. A seatbelt reminder is standard equipment now but a passenger reminder does not become standard until July 2013. The systems met Euro NCAP's requirements. A reminder for the rear seat belts is not available and there is no speed limitation device on the Aygo.